Art-lovers staring at these portraits will be the first, and last, to ever do so. The creation is the first self-generative AI artwork to go to auction created and only the second piece of art to be sold that uses AI. Artificial intelligence generates the images from scratch and produces an endless sequence of unique male and female portraits that have never been seen before and will never appear again. It is called Memories of Passersby 1, and is set to go to auction at Sotheby's in London on March 6 with an estimated value of between £30,00 and £40,000. 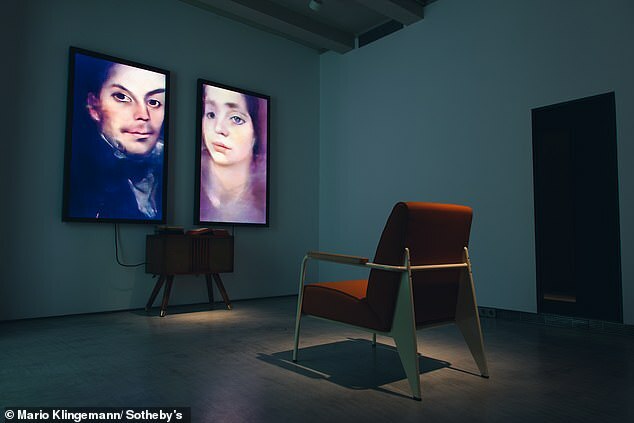 Two screens are attached to a retro-style wooden sideboard which contains the AI 'brain' and this produces the endless stream of art with a male-like image and a feminine image on separate displays. It was created by Mario Klingemann, a German artist who promises the buyer of the unique item a lifetime of totally original and encapsulating portraits. Electricity is all that is needed to keep the machinery operational and the AI uses a wealth of neural networks to continue learning in a similar way to the human mind. Thousands of images of western European art were used to establish the AI and the data-set, Mr Klingeman claims. Mr Klingemann said: 'Memories of Passersby I houses a very powerful machine which creates paintings while you look at them, which I think is quite magical. 'Neural networks are involved, and you could say that they are the brushes that I've learned to use. 'The machine is in a cycle where it continuously creates new faces that start changing and fading away - it observes itself and creates a feedback loop. 'Of course, it's hard for me let it out into the world without me by its side, but I trust that it's ready to keep creating new portraits forever, as I always hoped it would do. 'I hope that when people sit and watch these fleeting faces pass by, they will get the same feeling I do'. The artwork's predecessor, The Portrait of Edmond de Belamy was sold in October for £337,000, despite a guide price of only $10,000. Mr Klingemann says his work differs from that ground-breaking piece of art as it is not 'curated', where as Edmond had images cherry-picked by humans. The AI-generated 'Portrait of Edmond Belamy' depicts a slightly blurry, chubby man in a dark frock-coat and white collar. Christie's said the winning bidder wanted to remain anonymous, but confirmed the price skyrocketed after a five way bidding battle on the phones and via ChristiesLive. 'Behold the future—here it is,' the auctioneer declared before the bidding started on the piece. 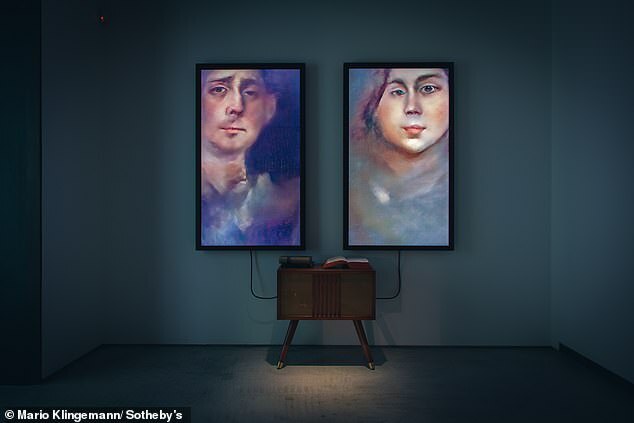 The artwork is one of a group of portraits of the fictional Belamy family created by a Paris-based trio of 25-year-olds known as Obvious. According to an online catalog on Christie's website, the painting had been estimated to go for $7,000-$10,000. The signature on the painting is the actual algorithm used to create it. His off-centre position leaves enough white space to show the artist's signature as 'min max Ex[log(D(x))] + Ez[log(1-D(G(z)))]. To make the painting, artist Pierre Fautrel and his team ran 15,000 classic portraits through a computer software. Once the software 'understood the rules of portraiture,' using a new algorithm developed by Google researcher Ian Goodfellow, it then generated a series of new images by itself, Fautrel said. The French collective selected 11, calling them the 'Belamy family,' one of which on Thursday fetched $432,500 at Christie's in New York, the epicenter of the traditional art market.